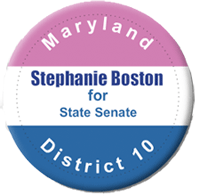 My mission for Legislative District 10 involves advancing programs to build stronger families and stronger communities. As we acknowledge society’s competing issues of budget deficits, rising home foreclosures, job losses, and the rising cost of health care, I will be an aggressive advocate to ensure the 10th District receives the services that are needed and the services in existence today do not diminish. I will fight for vocational opportunities in our educational system… not all youth and young adults are college bound; we need to prepare our youth and young adults for life skills and union apprenticeship programs. As a leader, that leads by example, I am committed to work side by side, hand in hand, to serve as a mentor to our children; a friend to those in need, and an advocate for our causes. Working to build stronger families for stronger communities is not just the mantra for my campaign; it is my cause. It is my belief that we, the people, must protect our most valuable assets by nurturing our children, and paying homage to our veterans and our senior citizens.